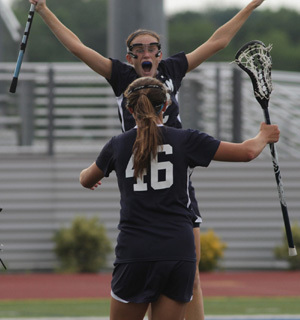 UNION – It may take awhile for the Chatham girls lacrosse team to fully appreciate what they did in the Tournament of Champions final on Saturday. The 12-11 loss to Moorestown doesn’t begin to describe how the Cougars had everyone at the game on the edge of their seats as they mounted an amazing comeback and provided one of the most thrilling endings in the history of girls lacrosse tournament play. Chatham rallied from a 12-4 deficit in the final 12:33 and nearly caught the undefeated Quakers clock watching. 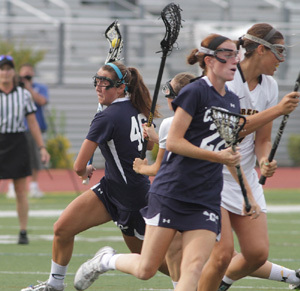 Mary Kate O’Neill and Jaclyn Leto fired hat tricks for the Cougars. Kelsey Perselay added a pair of goals and Kallan Murray, Lauren Maiorano and Brittany Marriott also connected for Chatham (23-3). The Moorestown (27-0) juggernaut is back with Carly Tagliente’s hat trick and a two-goal, two-assist effort by Stephanie Toy. They captured their 18th overall state title and fourth T of C title in six years, after a two-year drought. Chatham’s Kelsey Perselay jumps into Jaclyn Leto’s arms after scoring a goal in the Tournament of Champions final. Photo courtesy of Karen Fucito. The Quakers seemed comfortably in control with just over 13 minutes to go, when suddenly the Cougars received a spark that became an inferno. They began winning face offs. They began pushing to the cage. They began playing like Chatham has been playing all year. They were completely unafraid and hungry for victory. Brittany Marriott started it. Normally known for her defense, she pushed to the offensive end. She took a pass from Kelsey Perselay, split two defenders and found an opening. “On offense, once we started sinking our shots that was what we really needed,’’ Brittany Marriott said. “That got us the momentum and we really started going. 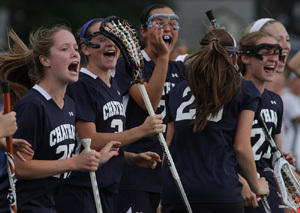 The Cougars bench was thrilled at Chatham’s second-half comeback during the T of C finals. Photo courtesy of Karen Fucito. Two minutes later, O’Neill connected on a feed from behind the cage by teammates Kate Murphy to make it 12-6 with 10 minutes left. Moorestown would eventually get a ground ball and run off a few minutes of clock. However, an Ashley Perselay ground ball gave the Cougars new life. Lauren Maiorano took a hard shot that flipped out of the stick of Moorestown goalie Amanda Currell. Leto came rushing in with every last ounce of strength and batted the ball back into the net to make it 12-7. Suddenly the crowd was buzzing. Chatham won the draw again. After a missed shot, Leto drew a blocking call. She set up for her free position with 5:54 and put in a righty shot to the right side with 5:54 left to make it 12-8. Chatham’s Jaclyn Leto (46) makes a move to the cage. The Cougars standout had a strong second half. Photo courtesy of Karen Fucito. Maiorano connected with 3:35 left in a brilliantly conceived play which had Leto drawing attention from the right side on another free position and Maiorano rushing in from the left and burying Leto’s feed. The score was 12-9 and the Quakers on the other side of the field were starting to show their concern. Transition scores brought about by tremendous team speed was what the Quakers suddenly had to deal with on the defensive end. The Cougars kept coming. Maiorano won a draw control and fed Perselay who burst up the middle and went untouched going to the net to make it 12-10. Just 12 seconds later Chatham scored again. This time Perselay won her own draw and fed Leto whose righty shot rattled the left side of the net to make it 12-11 with 2:52 left. Luck, energy, emotion, all of it seemed to be with the Cougars at that very moment. Chatham’s Lauren Maiorano works her way past a Moorestown defender. Photo courtesy of Karen Fucito. 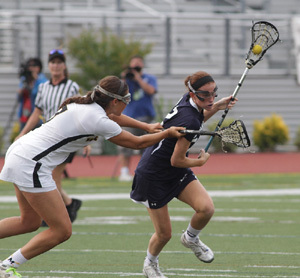 Moorestown’s Megan Kelly won an important draw control on the next faceoff. The Quakers whittled off some more time and would have been perfectly happy to run out the clock. However, Moorestown lost the ball twice in the final minute. Chatham couldn’t capitalize and in its excitement also turned the ball over. The final 20 seconds of the game was perfect chaos with bodies flying, wild cheering, no referee whistles and the scoreboard showing Moorestown was the winner once again. Almost the whole Chatham team was inconsolable afterwards. Even after ceremonial handshakes and announcements they ambled toward the exit, some players still bursting into uncontrollable sobs.